New electric, hybrid and plug-in hybrid cars are now the country’s least depreciating models, outperforming petrols and diesels, according to research by the UK’s leading consumer champion and new car buying platform, What Car?. What Car? 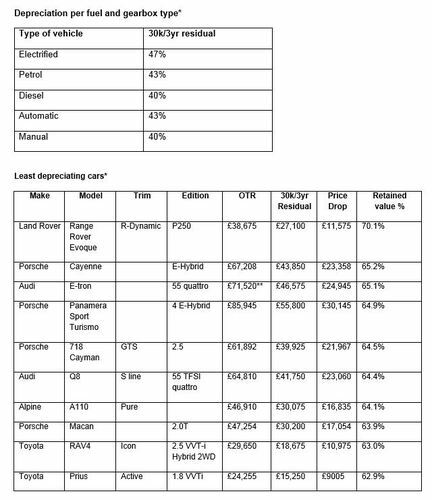 found electrified vehicles retain 47% of their value on average after three years and 30,000 miles, while petrol models were found to retain 43% and diesels just 40%*. Together with valuations specialist cap hpi, What Car? 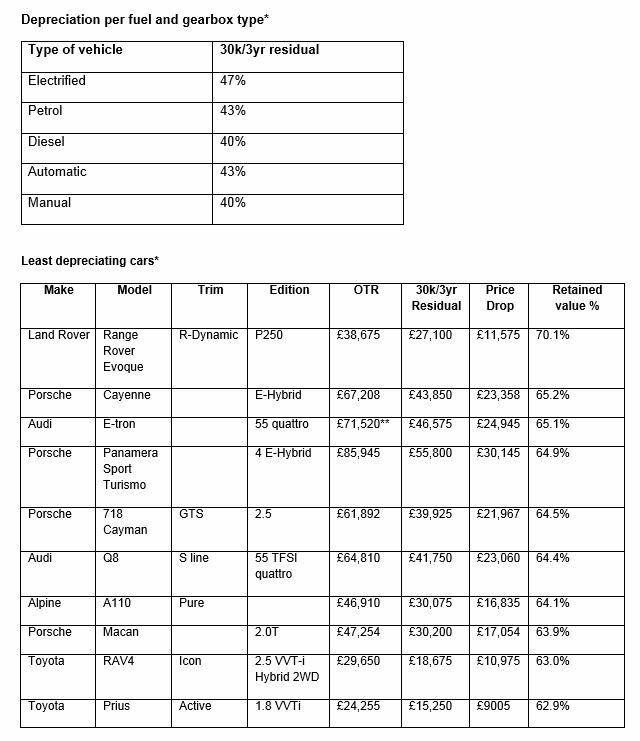 analysed more than 7000 different makes, models and trim configurations, to name Britain’s least and worst depreciating cars, with an overall retained value industry average of 42.1% across all makes and models. The findings are timely, because 2019 is set to be the year of the electric vehicle, with up to 20 new models due to be launched, as reported in the new What Car? Electric Vehicle White Paper. The White Paper found that consumers have a “knowledge gap” when it comes to understanding electric vehicles and their benefits, including how much they depreciate over time. Electric and hybrid vehicles have some of the strongest residuals across many segments, with models like the new Audi E-tron, Porsche Cayenne E-Hybrid and Toyota RAV4 all retaining more than 63% of their purchase value after three years and 30,000 miles in specific trim configurations. It wasn’t all good news for buyers thinking of going electric, because the Renault Zoe in R110 i Dynamique Nav form was found to be one of the UK’s worst depreciating cars, holding on to just 26.6% of its value. However, like other electric cars, the Zoe is eligible for a £3500 government grant, which helps offset this. Overall, premium brands were found to offer the best value for money, with Land Rover topping the ratings. The new Range Rover Evoque P250 R-Dynamic was rated as the UK’s least depreciating new car, retaining more than 70% of its £38,675 price tag after three years and 30,000 miles. To help car buyers, What Car’s team of mystery shoppers search out the best deals across the UK every month and compile a Target Price report. These prices show the level of discounts motorists should expect to achieve, and are the maximum people will pay if they use the What Car? New Car Buying service. 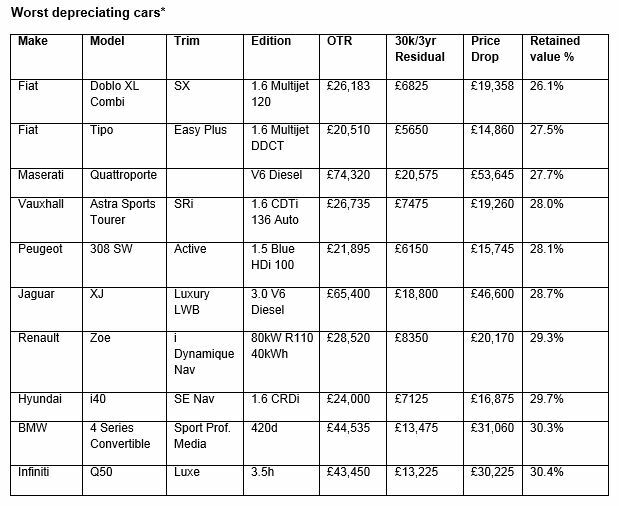 Note: The depreciation data in the tables relates to individual trim and edition configurations and is not fully representative of the entire model range. *Only cars with a list price of less than £100,000 were included in the findings. What Car?, the UK’s leading and most trusted car buying brand, has the magazine, a market-leading website and several established brand extensions, including True MPG and the annual Reliability Survey. It has helped Britain’s car buyers to make purchasing decisions for more than 40 years and its tests are widely regarded as the most trusted source of new car advice.